Early in his career as a narrator of audiobooks, George Guidall received a note from a truck driver in Montana. The man had been so absorbed in listening to Mr. Guidall’s eloquent recording of “Crime and Punishment” that he drove off the road. He was writing from his hospital bed to thank Mr. Guidall because he now had time to finish listening to the book. Mr. Guidall is the undisputed king of audiobooks: more than 1,300 so far, with a stack of new prospects beside his bed awaiting his attention. Audio is the fastest growing format for books, generating almost $643 million in sales last year, according to the Association of American Publishers, and providing a sideline for plenty of celebrities. That’s Claire Danes narrating “The Handmaid’s Tale,” Annette Bening doing “Mrs. Dalloway,” Christina Ricci reading “Gossip Girl” and Colin Firth intoning “The End of the Affair.” But Mr. Guidall’s rich baritone has been called the voice of choice in this burgeoning industry. It was while doing “A Flea in Her Ear” at the Long Wharf Theater in New Haven that he heard about a fellow actor leaving rehearsal early to narrate a book, and he started doing “talking books” for the blind. “It was a gig between shows,” he said. 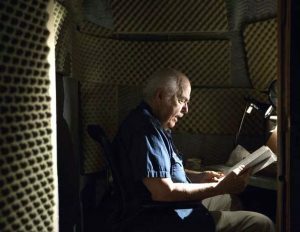 Most days, Mr. Guidall, 79, drives from his home in White Plains to nearby Irvington, where the owner of the Voiceworks company has outfitted his basement as a recording studio. He sits in a tiny booth lined with egg-crate-foam soundproofing, his longtime sound engineer Rich Samalin at a computer console right next to the washer and dryer. It usually takes three or four days to record a book. Mr. Guidall scans it beforehand but does not meet the author (“It wouldn’t do any good; the author would lay down a framework that I wouldn’t welcome”), occasionally adding an interview afterward. Sometimes a novel has a half-dozen characters on the same page, and he must give each a distinctive vocal identity, including the women. The cave people include some rather literary truckers who pass through a West Virginia town that’s a nexus of state highways, dropping off one recording at the local library and picking up another. It seems the only audience not captivated by Mr. Guidall is his grandchildren, who protest, “Grandpa, don’t use that voice.” He makes appearances at libraries around the country with a behind-the-scenes look at his work called “The Art and Artifice of Audiobook Narration,” and based on the feedback he gets, he believes he is providing something more than entertainment. The Prisoner by Alex Berenson–a riveting read.